Yesterday summer official ended for me, as I once again got back to the books. This year I'll be in 11th grade, and the prospects of what I'll be doing are exciting! Bookwise, I'll be doing Saxon Advanced Mathematics, The Human Body, and various other books my parents want me to read for History and English. I wasn't going to do Advanced Mathematics, for my parents aren't making me, but surprisingly I've found myself actually liking math! Shocking, I know. 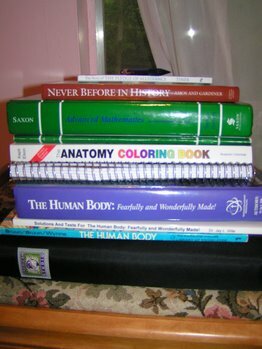 =) I'll be doing The Human Body: Fearfully and Wonderfully Made by Apologia for Science, and it looks interesting. We decided that studying the human body would be much more useful for a dancer, and hopefully future mother, rather than Physics! Try as he like, daddy still hasn't quite been able to link Physics to ballet. :-) Previous years I've done History and English textbooks put out by Bob Jones or ABEKA. This year, however, we've decided that I'll probably learn more reading different books about different periods in history, and I'll be reading a book about punctuation entitled Panda Eats Shoots and Leaves. I'll also most likely be writing quite a bit! For Bible, I'll be continuing Memlock, and hopefully memorizing the book of Ephesians. In addition to book work, I'll be getting training in many of the arts. I'll be continuing dance training, and will in fact be teaching two different The King's Praise Ballet classes. I'll also continue playing flute in the homeschool band, and will probably start piano lessons again. (I've taken for almost 2 years, when I was around 10). In addition, I'll be taking choir, and perhaps separate voice lessons. Daddy would like me to, but I need to make sure I don't get way too busy! So the year ahead does look very full, but I'm looking forward to all of the opportunities that come my way. In all that I do, I hope to bring glory to God. Actually, I'm sure physics is related to ballet, thought I haven't the knowledge to convince you. Have you seen Ice Princess? Cheesy Disney movie, but it relates physics to ice skating :). Sounds like you have an interesting year ahead of you! Well...math is okay. I'm enjoying it more this year than I have before. I started school back 3 weeks ago, I think. Can't wait to do choir with you, Anna! Sounds like you have a busy year ahead of you, but it seems fun getting to do more studying in the arts! I am not a math fan at all. English and History are my things. I have opted out of higher math, like Algebra II and even Geometry. I am doing Consumer Math (taxes, loans, etc.) I like it. Practical stuff! It sounds like you have an exciting year planned! You have a homeschool band? Wow! I wish the families in my area had a musical ensemble. Secondly, the book Eats, Shoots, and Leaves is wonderful. Of course, I'm slightly prejudiced because it is written by a British author, and it has to do with grammar. But it is intriguing and quite funny! School in general is grand, but Literature is grander. I hope you (have fun? It doesn't quite work) do well, and learn lots in the process of being taught. Susan: You are too funny! =) I haven't seen Ice Princess but I'd better not let daddy see it, or he may get ideas! hehe! When he was teaching us physical science, I had a lot of trouble with the math, because I was being taught it with my older siblings a year before I was "technically" supposed to do it. He tried explaining velocity and acceleration by saying, "Now there's two ballerina's running around on stage, one at this speed, and the other at that. When they collide, what is their decelleration (or something!). It didn't really help though. I just sat there and said, "But Daddy, ballerinas don't run into each other! I love my dear daddy! Ella: I understand you doing more practical math. I don't know where I'll use this, besides hopefully teaching my own children someday. It's funny, because I never really started liking math until Algebra... when most people begin to hate it. Weird. Lioness_For_Him: Yes, Apologia is great! I've really enjoyed his books. Amazingly, I didn't do that great in Physical science either. I used those books in HS too!